Since the Bolshevik Revolution, Russia has been an espionage superpower. The reasons for Russian excellence at spying lie deep in the nation’s culture and history, factors which suited the eventual development of a world-class intelligence service. Centuries of dynastic rule, the Byzantine nature of the Russian state and attendant intrigue sharpened the skills of deception necessary in the struggle for power. The mobilization political culture that led to the creation of the Russian secret services stretches back a thousand years. The feuding medieval principalities of Rus’ formed alliances and betrayed each other with regularity. To centralize his power Ivan IV, “The Dread”, formed a precursor to the secret police, the black-clad Oprichniki, to wipe out opposition and sow terror among enemies real and imagined. The Romanov Tsars, meanwhile, maintained all manner of secret chancelleries that culminated in the Third Section of Nicholas I[i]. Through the Third Section, Nicholas established a security service his successors presided over until the autocracy’s overthrow in the Russian Revolution. Over the course of the 19th century, political opposition was made to match wits with the Tsar’s gendarmes, and this circumstance laid the foundations for the more ruthless and sophisticated Soviet secret police. Marxist and anarchist radicals lived a twilight existence punctuated by flashes of revolutionary violence. The assumption of false identities, organization into cells, and covert means of communication became the means to survive and advance the cause against the Tsarist state. These tactics formed the tradecraft of secret operations, known as konspiratsia in Russian. Police surveillance, informers and penetration agents heightened the need for ever greater vigilance and secrecy in the paranoid netherworld of konspiratsia. Vladimir Lenin, Leon Trotsky and Josef Stalin were known in their pre-revolutionary lives respectively as Ulyanov, Bronstein and Dzhugashvili. The men who organized and wielded Soviet power had long years of underground experience, which shaped the formation of their secret service. The founder of the Soviet secret police, the Cheka (All-Russian Extraordinary Commission for Combating Counterrevolution and Sabotage) was far from a novice at underground revolutionary work. Feliks Edmundovich Dzerzhinsky was the son of a Polish noble family. As a youth he aspired to become a Catholic priest, but had from his student days converted to the Communist faith. Dzerzhinsky was thoroughly familiar with the police practices of the Tsar’s Okhrana, the successor to the Third Section. After several arrests, he became well-practiced at escaping government captivity. As head of the Cheka, “Iron Feliks” was tasked with protecting the revolution from subversion, both internal and external, by any means. And so at Lenin’s behest, Dzerzhinsky, that “ascetic, monk-like, cold-blooded and incorruptible figure” created a merciless secret police force[ii]. The Cheka’s methods within Russia were far more brutal and murderous than any measures experienced under the Tsars, and they secured the Bolsheviks’ initially tenuous grip on power. Dzerzhinsky’s new headquarters, a cream-colored building on Lubyanka square, became a symbol of the repression and terror inaugurated by Lenin. The Soviet secret service was also deployed abroad, where its work was by necessity somewhat more discrete. Bearing the standard of global revolution, Marxist Russia wasted no time in making enemies, ranging from the anti-Bolshevik White Russian movement to the states that “intervened” in Russia after its catastrophic plunge into Civil War in 1918. The fledgling Soviet government needed a way to monitor developments abroad and prevent any plots by White émigrés and their foreign supporters from reaching fruition. With this objective in mind, in December of 1920 Dzerzhinsky formed a fully-fledged intelligence service known as the Foreign Department (INO). The Cheka’s INO had by the end of the 1920s built up a formidable overseas espionage apparatus, with around 60 staff officers deployed in the capitals of Europe, Asia and North America[iii]. The intelligence INO officers gathered from agents and transmitted to Moscow inflicted serious damage on White émigré initiatives against the Soviet Union. INO operations also informed the Politburo on the intentions and capabilities of the states it faced in the international arena. The Soviet state from the beginning of its existence maintained a siege mentality in relation to the countries beyond its borders. The collection of secret information on foreign opponents was of the highest priority for the Soviet leadership and a pressing task for its spies. To obtain strategic intelligence or deal a crippling blow to anti-Soviet émigré groups, any and all methods could be applied. Espionage is by its nature an ethically dubious enterprise. Yet Marxism-Leninism as a mindset also made the Soviet secret service more brutal, effective and innovative than its Tsarist predecessor. The Bolsheviks’ contempt for “bourgeois” moral strictures meant that any and all means were available for gaining political control of the country. Lenin’s political adaptation of Marxist philosophy emphasized expediency, deception and aggression in order to attain unlimited power. Konspiratsia was a principal method to subvert the societies of the West and usher in the global triumph of Communism. The unprecedented power of the Soviet secret service can to some extent be attributed to the materialist philosophy of the Bolshevik revolutionaries. The great twentieth-century Russian philosopher Nikolai Berdyaev remarked that, “the organization of the unity of spirit and worldview by state power leads in practice mainly to the strengthening of the state police organs and espionage”[iv].The founders of the Soviet state inhabited a moral universe centered on the proletariat, led, of course, by the Communist Party. Under the reasoning of Marxist-Leninist dialectical materialism, any action that advanced the revolution could be justified. Thus the Soviet intelligence service obeyed only one ethic: to serve the Party in Moscow, the vanguard of world revolution. The covert war with the enemies of the revolution, within Russia and without, demanded utter ruthlessness. Such a hardened, even callous mindset was deemed necessary to achieve the radiant future that Communist ideology promised. It was this promise that so attracted many impassioned Marxists and fellow-travelers in other countries to flock to the Soviet banner. The beckoning star of utopia burned bright in the minds of many Western intellectuals during the reigns of Lenin and Stalin. The Kremlin controlled the Third Communist International, known as the Comintern, and exercised significant influence over numerous associated political parties, labor unions and newspapers. Party members and sympathizers to the cause formed a support network that wittingly or unwittingly advanced Soviet foreign policy and propaganda. A few of these individuals were noticed by INO “talent spotters” both for their convictions and potential access to government secrets. Among them was British intelligence officer Harold “Kim” Philby, who would for three decades betray Crown secrets to the Soviets. Philby had been committed to Communism since his days at Cambridge, and was recognized as a bright prospect in Vienna in 1934, where he began underground work with a Comintern front organization[v]. Arnold Deutsch, the deep-cover intelligence officer who recruited him, was an Austrian Jew and disciple of Wilhelm Reich, and equally drawn to Marxism’s “scientifically based” analysis and revolutionary vision. Communist solidarity proved to be a tremendous asset in the recruitment and running of agents in the West. Ideological fervor was not the only advantage accrued to Soviet intelligence as it sought to ferret out secrets from the nations beyond its borders. The Bolsheviks were relentless modernizers and sought, in the words of Lenin, to fashion a new society through “Soviet power plus electrification”. To meet the leadership’s practically unlimited demands for security, the Cheka expanded and reorganized as the GPU, OGPU, and NKVD. Throughout the 1920s and 30s, the growth of the security apparatus was accompanied by increased specialization of functions, such as the formation of the foreign intelligence arm, the INO, and its components for political, economic and industrial espionage. At the same time, the secret police underwent a standardization of procedure that promoted uniformity in training and operations. Along with a military chain of command, these factors made the Soviet intelligence service into a formidable and effective espionage system. The INO ran most of its agent networks out of Soviet embassies and consulates. Moscow’s intelligence officers could work under official cover, whether as diplomats, journalists, or trade representatives. In a world of mutual hostility between the two ideological “camps”, however, the Soviet state could not rely upon its embassies as the sole vehicles for intelligence collection. Instances such as Britain’s severance of diplomatic relations with the USSR in 1927 made this abundantly clear[vi]. How was an asset to receive regular instructions and deliver secrets if his controlling officer had been expelled as persona non grata? Counterintelligence pressure from the host nation could also freeze espionage work. In such cases, the Soviet secret service needed to maintain steady channels of contact in the target country to receive any potentially vital information. Due to challenges in Moscow’s relations with many countries, the INO had throughout the twenties occasionally deployed officers abroad without diplomatic cover. Because of their lack of any official status or recognition by the Soviet government, these spies were known as illegals. By 1930, espionage conducted under a false identity and without accreditation took on new significance for Soviet intelligence. In that year, the service was restructured to reflect targeting priorities. One major innovation was the creation of an Illegals Section within the INO. Its deep-cover intelligence operatives were now formed into an elite force, the first of its kind in the world of espionage. The Illegals Section was designed by the Soviet leadership as a strategic instrument[vii]. Stalin’s Politburo was at the time seized by the (unfounded) notion that the capitalist powers sought to initiate a war against the Soviet Union. The illegals would therefore deploy to target countries under deep cover (legends) and set up bases of operations, known as residencies. Illegal residencies could collect intelligence and run agents at less risk of detection than their embassy colleagues. By masquerading as citizens of the target (or a third) country, illegal officers were almost impossible for counterintelligence services to trace. If relations between the Soviet Union and another state were disrupted by crisis or war, INO illegal residencies would be expected to continue functioning and take control of agent networks previously run from the embassy. The timely transfer of crucial information to Moscow could assume strategic significance in the arena of war and diplomacy. Along with deep-cover intelligence operations, the Politburo assigned one other major task to illegals: “wet affairs”, the liquidation of enemies of the Soviet state. Secret services around the world have carried out targeted killings, though the phenomenon is rarer than its representation in spy novels. Soviet intelligence, however, lent credence to such popular conceptions by its fearsome methods. The repression spawned by Stalin’s malignant paranoia was projected overseas, as well. Moscow was ruthless in its pursuit of defectors, anti-Soviet émigré leaders, and individuals deemed dangerous to its interests. Men such as the exiled Bolshevik Leon Trotsky, White Russian generals, and others would fall victim to a concerted effort aimed at their destruction. Dispatching assassins abroad to hunt down their targets required a clandestine system of support and logistics to evade hostile security services. In the first decade of Soviet power, the Cheka and its successors enacted “special measures” beyond state borders, but there was no central department to direct this gruesome activity. Within the INO a separate “Special Group” was formed in 1929 to undertake missions to kill or kidnap those targeted by the Kremlin[viii]. Its founding heralded a decade of executions abroad as Soviet hit teams roamed Europe and took part in the bloody Spanish Civil War. The Special Group was a parallel structure to the Illegals Section, and illegal officers served in its ranks. The unit was also equipped with a poisons laboratory and ran its own foreign residencies and agent networks[ix]. Like the rest of the Soviet security apparatus, the Special Group was purged, reorganized, and would eventually become the 4th Directorate of the NKVD during the Second World War. Lubyanka’s special units would provide invaluable services to the Soviet Union in its mortal struggle with Nazi Germany. Soviet operatives waged a campaign of espionage, sabotage, and assassinations from South America to Wehrmacht-occupied territory on the Eastern Front. One of the most storied illegals from this era was NKVD special agent Nikolai Kuznetsov, who convincingly posed as Prussian Wehrmacht Lieutenant Paul Siebert in occupied Ukraine, running an intelligence network and killing several German high officials[x]. The film Podvig Razvedchika (Expolits of an Intelligence Officer) was loosely based on his record and influenced young men like Vladimir Putin to enter the KGB. 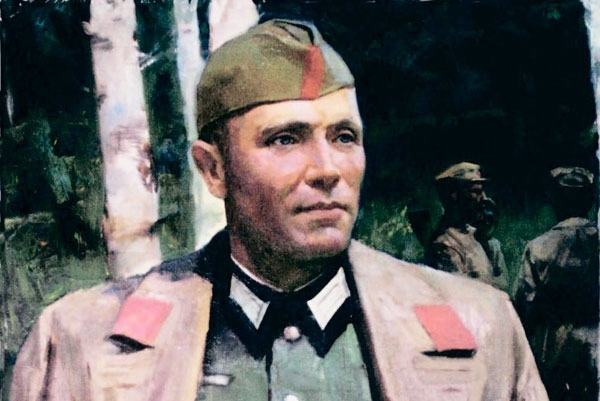 Nikolai Ivanovich Kuznetsov, the NKVD illegal who posed as Wehrmacht Lieutenant Paul Siebert in direct-action missions behind German lines. By the late 1940s, it should also be noted that the ethnic character of Soviet intelligence had been transformed. Gone were the days of the internationalist INO, in which the department’s leadership and many of its operatives were of Jewish descent or foreign Communists, including many Latvians, Poles and Hungarians. Men like Mikhail Trilisser, Sergei Shpigelglaz, Teodor Maly and Abram Slutsky had already met their fate in the pre-war meat grinder. With Stalin’s last major purge, this time unleashed in 1948 against “rootless cosmopolitanism”, the intelligence apparatus was being consolidated into a largely Slavic/Great Russian entity[xi]. As the Cold War progressed, illegals who were to be deployed abroad were much more likely to be Russians (as well as Armenians, Central Asians, etc.) who had lived their entire lives in the Soviet Union. Communist ideology was still the religion of the security organs and the rest of the state, but there was now a prominent accent on “socialist patriotism” that would remain throughout the Soviet-American competition for global dominance. At the onset of the Cold War, the illegals were presented another complex challenge. Washington was no longer an ally; indeed it had become the “Main Adversary” in Soviet parlance. Confrontation with the United States made intelligence targeting into Western Europe and North America especially critical. The Kremlin needed the inside track on the US strategic posture and Western policy aims, but first and foremost the Kremlin leadership wanted early warning[xii]. Hitler’s Operation Barbarossa had forever seared into the minds of the Soviet policy elite the necessity of preventive intelligence (Although the strategic surprise the German general staff achieved was largely due to Stalin’s shoddy analysis of the situation). With the U.S. building a network of alliances and bases in Eurasia’s outer rim to contain Soviet power, Moscow moved its espionage campaign into high gear. With the creation of the KGB in 1954, illegal operations would be run from Directorate S, in turn part of Lubyanka’s First Chief Directorate (foreign intelligence)[xiii]. Illegal officers were highly prized assets in the struggle with the West because of their invisibility. “Legal” residencies run out of Soviet embassies and trade delegations were dutifully monitored by counterintelligence services like MI5, France’s DST and the FBI. Meanwhile illegals would assume foreign identities, cultivate their legends for years, and blend into their host society. Without intelligence acquired from a defector or a penetration, a Soviet illegal was just about impossible to track down. Moscow Center therefore ran some of its most valued agents through illegal networks to insulate them from detection. Through these operations, the Soviet secret service also looked to form ties with powerbrokers and policymakers in target nations. In one extraordinary instance, the illegal officer and Spanish Civil War veteran Josef Grigulevich was the Costa Rican embassy’s Chargé d‘Affaires for Italy, the Vatican and Yugoslavia from 1951 to 1953[xiv]. In addition to raising the bar for classical espionage, the Soviets never ceased their involvement in direct-action missions. Officially the KGB’s last killing was carried out in 1959 by the illegal Bogdan Stashinsky against the Ukrainian nationalist Stepan Bandera. Yet Soviet intelligence continued to field an assassination capability for the remainder of its existence. This unit specializing in “wet affairs” underwent numerous reorganizations due to defections (such as Stashinsky’s) and scandals, starting off as the fittingly-named 13th Department under Khrushchev until it finally became the Illegals Directorate’s 8th Department[xv]. It made perfect sense for the KGB to house deep-cover intelligence officers and a special operations component under the same roof because of shared assignments. Directorate S was engaged in identifying and building comprehensive intelligence profiles on both foreign leaders and military commands and strategic infrastructure. In a time of war or crisis, commandos from its own Vympel group would infiltrate hostile nations, and with the assistance of Soviet illegal networks, neutralize their targets. In one such actual instance, chief of the Illegals Directorate General Yurii Drozdov directed the storm of Kabul’s Tazh-Bek Palace and the assassination of the troublesome Afghan president Hafizullah Amin in 1979[xvi]. At this crossroads of Russian history, the KGB’s illegals and special operators set the stage for Moscow’s disastrous occupation of Afghanistan and the long twilight of Soviet power. With the fall of the Soviet Union and the liberalization, chaos and weakness of the 1990s, Russia experienced severe geopolitical and economic retrenchment. For the past decade, though, Moscow has worked to restore its regional and international position according to its national interests rather than Marxist-Leninist ideology. The former intelligence officer Vladimir Putin has been at the helm of this drive. Putin and his colleagues understand well the role of espionage as an instrument of policy. The Kremlin has put its spies from the GRU (military intelligence) and the SVR (the First Chief Directorate’s successor service) to good use. The SVR has been acquiring all manner of Western technologies, working in tandem with energy giants like Gazprom and Lukoil to advance Russian strategic objectives in Europe, and mounting influence operations against NATO expansion and the placement of U.S. missile defense systems on Russia’s frontiers. The revelations from the June 29th arrests in cities across America’s East Coast make it clear that Moscow Center still values its illegals for intelligence collection and other covert activities. The media has sensationalized the episode and lent it a comic atmosphere, largely drawn from the glamorous lifestyles of more peripheral players. But it would be a mistake to cast the captured officers as incompetents without significant details on their discovery by the FBI, or what the Russians knew, and when they knew it, from their own counterespionage work. Illegal intelligence officers are regarded as world-class both by the service that fields them, the SVR, and its foes. Human intelligence is a rather murky business, and the public often only learns about the exploits of spies through their failures. In an analogous case four years ago in Canada, we were reminded by the talented Mr. Hampel that Russia continues to deploy deep-cover operatives to the West[xvii]. In 2008, it was revealed that an SVR illegal was the handler of Hermann Simm, the Estonian defense official who provided Moscow an insider’s view of NATO’s most guarded secrets[xviii]. While the SVR today plays a more limited role in special operations (the FSB is another matter entirely), its Directorate S is alive, kicking and operating throughout the world. The illegals represent the pinnacle of the Russian secret service tradition, a line of work with centuries of heritage, and one no less relevant in the contemporary Great Game. [x] Gladkov, Teodor. Legenda Sovetskoi Razvedki. Izdatelstvo Veche, 2001. Moskva.